With a cool ocean breeze under a cloudless sky, children weave small sailboats through the channel. Larger boats scurry out of Waquoit Bay to fish in Nantucket Sound or spend a day at Martha’s Vineyard. Those not on the water are hitting tennis balls or relaxing by the beach. It’s a typical summer day at the Menauhant Yacht Club in East Falmouth, Mass. A picture-postcard scene you could find at any yacht club on Cape Cod in July—except for a tangled hose attached to a pump and a littering of filters and bottles spread out on a floating dock. A young woman in pigtails leans over the dock to pull two large orange bags from the water. For the most part, people are too busy to inquire to why she’s there, but occasionally some do. For the past three years, I’ve spent my summers sampling Waquoit Bay for larvae of clams, scallops, and oysters. I sample wherever and whenever I can. I’ve sampled from docks, boats, and kayaks; at boat yards, yacht clubs, and research stations. I’ve sampled weekly, daily, and even for 48 hours straight. All this sampling has earned me the nickname “Bug Girl” with some of the harbormasters in the bay. Larvae and other plankton are like the bugs of the sea. Suspended in the water, floating in unseen hordes, larvae are transported by wind and tidal currents until they settle and grow into adults. But this critical stage in the lifecycle remains largely a mystery. Larvae are small, and their paths are hard to follow. The larvae of bivalved shellfish are nearly impossible to identify, even for an expert. But I hope to overcome these obstacles with my doctoral research in the MIT/WHOI Joint Program. Understanding bivalves’ larval stage could reveal ways to help reverse the population declines of tasty shellfish. In the town of Mashpee on the eastern side of the bay, shellfish constable Richard York has a vested interest in my study. He grows millions of adult shellfish to place into the bay each year for a commercial and recreational fishery, but he can’t tell if they produce larvae. To find larvae, which are no bigger than a fine grain of sand, I have to filter hundreds of liters of water and count them under a microscope. When people find me working, they often ask me about the water quality. Some want to know if there’s fish around, or why there was a blue crab die-off this spring. I don’t always know the answers to their questions; I’ve only lived on Cape Cod for three years. Many of the people I meet have come here their whole lives and know more about the bay than I ever will. On this particular day at the club, a man and his son pull their boat alongside the dock as I’m rinsing the orange bags into a bucket. The red-white-and-blue theme of their clothing reminds me that a popular holiday is approaching, which is also reflected by an increase in boat traffic. The man asks me if he can borrow the hose to wash his boat. “May I ask what you are doing?” he says. “I’m looking for shellfish larvae,” I tell him; it’s my default response to this common question. I wait to gauge a person’s interest before adding more details. This time their interest seems to have been sparked, as the son, who looks to be around 10 or 12, climbs out of the boat to look in my bucket. “Do you see any?” he asks. I tell him they are small, and you need a microscope to see them. Under a microscope, larvae appear as transparent semi-circles with tissue containing digestive organs and swimming appendages. Just like the adults, the larvae have a shell made of aragonite, a calcium-containing mineral. When viewed using a polarization filter, the crystals in the larval shell cause it to reflect bright color patterns. The patterns produced are different for each species, and with the help of a computer and image-recognition software, can be used to distinguish individual species. I tell the boy and his father that I am particularly interested in scallops, and I am using the orange mesh bags to collect the older larvae. I explain eutrophication: how the increased number of septic systems in the surrounding neighborhoods has loaded the bay with nitrogen from waste and fertilizer, stimulating rampant growth of large algae that blocks sunlight from reaching the eelgrass on the bottom. That has diminished the eelgrass, an essential habitat where bay scallop larvae settle to grow to adulthood. I’m hoping the mesh bags hung from the dock will attract scallop larvae to settle on them much the way the eelgrass would have. “You don’t see scallops around here anymore,” the son agrees. Even five to 10 years ago, they were pretty hard to find. I am waiting to meet with my Ph.D. advisor, Scott Gallager, a scientist at WHOI, and Chris Weidman, director of research at the nearby Waquoit Bay National Estuarine Research Reserve. Decades of research at the reserve have put Waquoit Bay on the map as a case study for the effects of eutrophication on estuaries. The loss of the scallop fishery is only a small piece of the story, but an important one for shellfish lovers. An adult bay scallop will release millions of egg and sperm cells into the water each summer. Twenty-four hours after fertilization, a larva’s shell forms, and it begins its journey. A larva will spend up to two weeks drifting in the water column, subjected to various environmental hazards. Only a very small percentage can manage to find food, avoid being eaten (or sucked up in a plankton pump), and find a suitable place to settle and metamorphose. Water is flushed out of Waquoit Bay every three days with the tides. 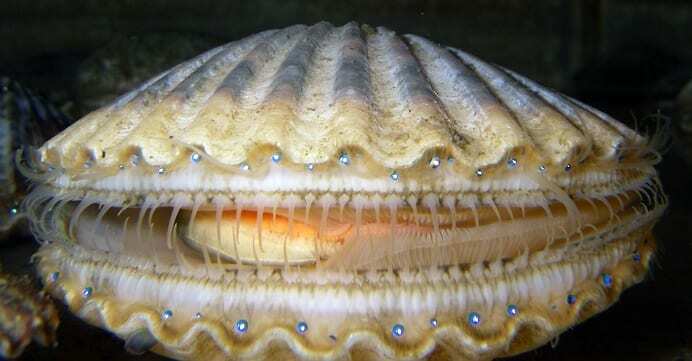 If a bay scallop is spawned in the bay, it cannot swim faster than the tidal currents and will not likely stay there. It may end up offshore, swept into a neighboring estuary, or die before finding an eelgrass bed. There is a chance a larva may sink to the bottom on an outgoing tide to avoid moving with the strongest currents, and larvae from areas offshore may be able to make their way into the bay on incoming tides. To investigate these hypotheses, I need to take samples over the entire tidal cycle and at different depths. Scott and Chris are here to help get the tidal samples. We are installing an automatic system of valves with filters hooked up to a pump to sample water continuously over each incoming and outgoing tide. I have a sister system on the Mashpee side of the bay. The system is programmed to open or close one of four valves with each tide. This allows me to sample over a lunar tidal cycle (about 28 days) and compare the flux of larvae that enter and leave the bay but I don’t have to be present to sample each tide. After we discuss plans for the installation, Scott and Chris leave, and I get set up to take my weekly sample. A man wearing a yacht club polo shirt walks up to me, followed close behind by his dog—a little pug sporting a matching nautical-themed collar. He sees that I am doing research and asks me a few questions while I sample; a retired scientist himself, he is curious about Woods Hole Oceanographic Institution and the state-of-the-art research pursued there. He is surprised and pleased that I am taking the opportunity to sample in my own backyard. One doesn’t have to go to exotic places to apply new technology to scientific questions. In Waquoit Bay, we can now look at the species composition of shellfish from each plankton sample I collect. This can determine when species are present, how they grow and survive, and how their vertical swimming behavior influences their transport with tidal currents. Such fundamental missing information is essential for efforts to sustain a natural population through eelgrass restoration. From an economic perspective, these samples allow managers to see the results of their labors to sustain recreational fisheries. As we fill in the blanks between the larval and the adult stages of shellfish, my new friends at the yacht club can enjoy more clambakes with quahogs from the bay. As I talk with this man, his dog eyes my hose pumping water and starts to pant. The man takes him to a nearby hose to get a drink. I soon finish my sample and walk over to hose off my filters. The dog still drinks up, and I wonder how many of my colleagues must share equipment with kids and canines. I wait my turn. 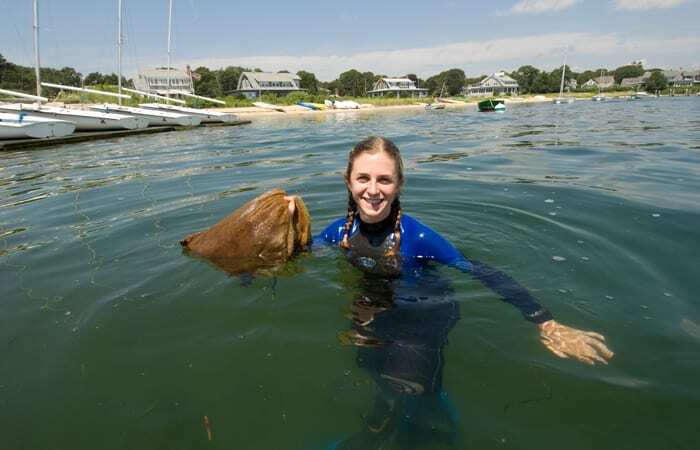 Christine Mingione’ s research has been supported by a National Estuarine Research Reserve Graduate Research Fellowship through the National Oceanic and Atmospheric Administration and a grant from the WHOI Coastal Ocean Institute. She also has been supported by the J. Seward Johnson Fund and the Richard Vanstone Fund. 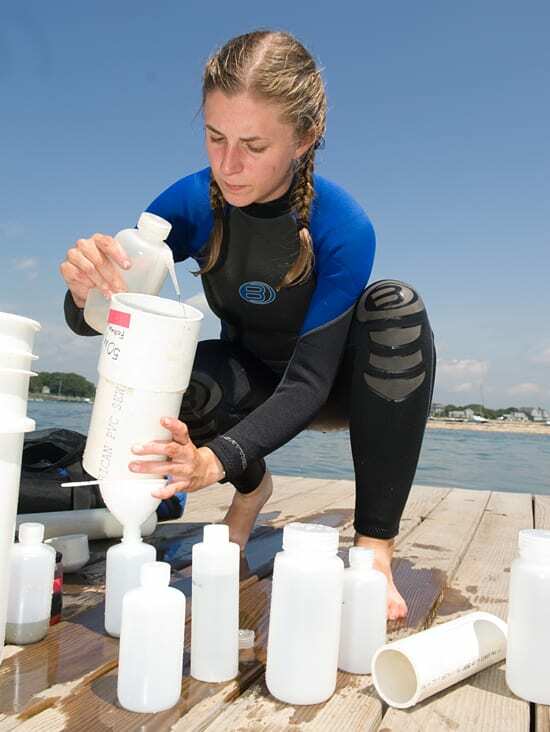 This article was written during a science writing course for graduate students at WHOI, supported by funds from The Henry L. and Grace Doherty Professor of Oceanography. It's hard to tell the difference among early larval stages of various shellfish. But under polarized light, different species of larvae show different birefringence patterns, based on the crystal orientation of the calcium-containing minerals that make up their shells. Later-staged larvae begin to have body shapes that makes them easier to distinguish.